Dr. Taft came back, just in time to watch Gibbs collapse. 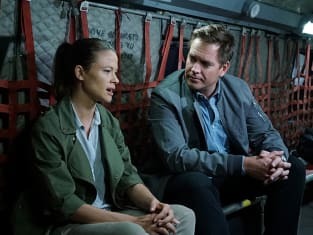 And Tony finally had a chance to get some closure with Jeanne Benoit by helping her rescue her husband in the Sudan on NCIS Season 13 Episode 8. Below, TV Fanatic panelists David Taylor, Christine Orlando, Kathleen Wiedel and Douglas Wolfe discuss the events of this exciting episode. Let us know your take on all of it! Kathleen: Paying the price of the past. Doug: You're not a young man anymore, Gibbs. What is your favorite scene or quote? 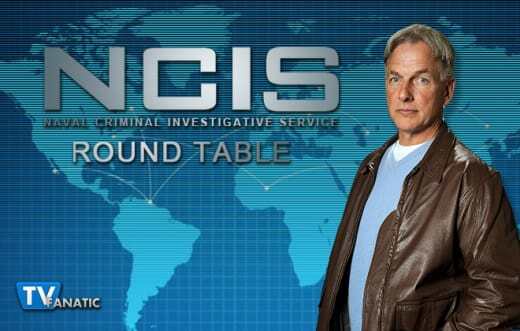 David: I liked McGee's ribbing Tony about talking to Jeanne on the flight to Sudan, as quoted by Doug in his review. Tony was clearly gun-shy about talking to her and McGee didn't let him get away with it. Good on him!!!! Christine: I simply loved having Jeanne Benoit back. I always felt that was a huge personal plot point for Tony that was left dangling. I’m glad they gave him some sort of closure. Doug: David's favorite is mine as well. I enjoyed watching McGee just sit there patiently, and saying nothing while Tony tried to reach his own truth on Jeanne Benoit. David: I'm not sure I understood why the Sudanese soldiers were traveling from village to village. They attacked the facility in Togu and took two doctors. What else were they looking for? Christine: I’m with David on this one. They took the doctors to save their General but why keep dragging everyone around from village to village. Wouldn’t it have been smarter to make the doctors treat him at their makeshift clinic in the first place? Kathleen: Christine hit the nail on the head for me. Wouldn't it have made more sense to treat the general at the clinic with all the doctors rather than kill some and drag two back to somewhere else? Doug: The whole "don't let him die or you'll die" thing was illogical. The doctor clearly told them what was needed in order to ensure his survival. So, what – the general dies and they shoot the medical team. What then? It didn't make a whole lot of sense. What are your thoughts on the rescue? David: My initial thought was "They're either brave....or crazy." Then when the helo showed up at the last minute (like we all KNEW it would since this is television) and shot everything to pieces, I thought "That's our Gibbs – using his clout to send in the firepower." Christine: When they shot the gas tanks to cause a diversion, I thought it was a little too The A-team. After that I just kind of went with it and thought the helicopter to the rescue was fun. Who doesn't enjoy seeing the cavalry save the day? Kathleen: It was pretty A-Team, wasn't it? Anyway, it actually reminded me a bit of a helicopter rescue that happened waaaay back in JAG Season 1 Episode 9, when Harm was rescuing a Marine from Iraq and they are being chased by the Iraqi military, only for an American helicopter to pop up out of nowhere to save the day. Doug: Yeah, I really liked seeing that helicopter come in to save the day. However, the original plan to create a diversion and sneak the medical team out smacked of "suicide mission". In the real world, I can't imagine three people ever doing something like that against a rebel army. Will Gibbs be forced to take more of a back seat over the next little while? David: I think so. Gibbs has some major "processing" to do and I was kinda surprised that he made Taft his de facto counselor / therapist since Taft is a surgeon, not a shrink. After the episode concluded, I wondered whether this could be a vehicle for getting "Dr. Kate's Sister" back on the show for a recurring role since her character IS a psychologist / therapist. 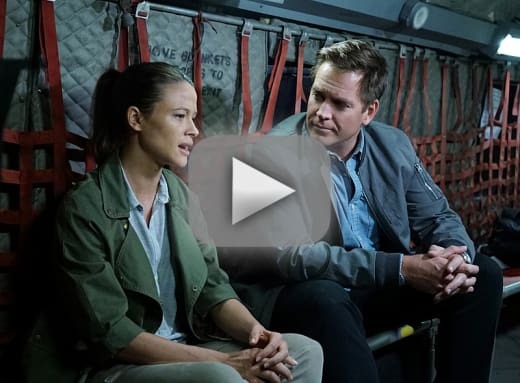 However, as Doug mentioned in his review, it looks like Gibbs and Taft have bonded so this seems more like a vehicle for Cryer to have a recurring role. Christine: Gibbs can never do anything the easy way. After being shot on the job, I’m surprised he wasn’t forced into therapy before returning to work. I’m not sure that doing “therapy” with Taft makes sense but I love Dr. Taft and they do have some issues in common so I’m looking forward to seeing how this plays out. Kathleen: Realistically, Gibbs should step back. Of course, as Christine pointed out, Gibbs really hasn't ever been one for doing things the easy way. Doug: I agree, Kathleen. Gibbs has never been known to sit back while others do the work. It's just not his style. I think really his only hope will be these sessions with Taft. The doctor won't let him get away with flip answers. He's going to want to get to the meat of the matter, where Gibbs actually lives. From there, who can say what Gibbs will decide?